We have collected and analysed 17 expert reviews and 56 user reviews from international sources. Experts rate this product 88/100 and users rate it 80/100. The average review date is 03-12-2014. We have compared these reviews to 6376 reviews from other Drones. The alaScore™ for this product is 86/100 = Very good. Last update: 18-04-2019.
alaTest has collected and analyzed 46 user reviews of DJI Phantom 2 Vision+ / 2 Vision Plus from Amazon.com. The average user rating for this product is 3.9/5, compared to an average user rating of 4.3/5 for other products in the same category on Amazon.com. Comments about the image quality and size are on the whole positive. The portability and usability are also mentioned favorably, whereas some have doubts about the price and reliability. 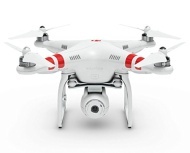 At under £700 now, the Phantom 2 Vision Plus V3 is an awesome piece of kit and delivers great 1080p aerial footage. The DJI Phantom 2 Vision+ drone is incredibly fun to fly and captures solid 1080p video, but its battery life is very limited. Easy to learn to fly. Integrated camera with stabilization system. 1080p video capture. Shoots JPG and Raw stills. Built-in GPS. App works with iOS and Android devices. Durable. Return-to-home safety and low battery safety features. Pricey. Feed stalls when capturing a still. 3,000-foot operating range is an optimistic estimate. Battery life limits flying time. More powerful than your average toy quadcopter, but not as intimidating as DIY enthusiast models, the DJI Phantom 2 Vision+ falls in a sweet spot for anyone who wants to get started capturing videos and photos from the sky. An excellent entry point into the world of aerial photos and video, DJI's Phantom 2 Vision+ is worth the cost for its simple setup and use. Overall, the DJI Phantom 2 Vision+ is the best consumer drone available. It comes with everything you need to fly, and it performs phenomenally. Plus, it has built-in GPS and a camera that takes incredible photos and high-quality aerial footage. The drone has a built-in camera and a three-axis, brushless gimbal to keep it steady. This drone isn't as simple to fly as others on the market. The Phantom 2 Vision+ drone is small but sturdy. It is a serious UAV that takes phenomenal photographs from impressive heights. This drone has a battery life of 25 minutes, which is as long as it gets. The drone doesn't have a stabilization gimbal. DJI's Phantom 2 Vision is easily one of the best drones available. It has excellent battery life, produces fantastic quality footage and stills and is fast and fun to fly.